safety and flexibility of movement. When the ice melts, players do not have to worry about it ! Newron offers the hockey player the same stride on a hard surface as on ice. 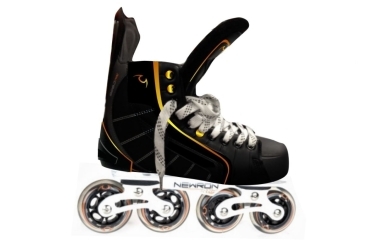 Thanks to wheels mounted in pairs on a light frame with suspension, this facilitates fast departures with the toe kick and imitating perfect cross overs, the skate Newron is a revolutionary product. 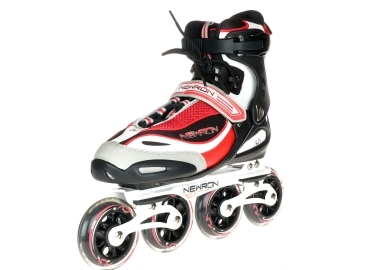 The Newron inline technology offers a perfect transition from hard surfaces to the ice rink. Now, players can substitute the expensive ice time for free concrete or asphalt surfaces around the world, and workouts are not limited by time constraints but rather the endurance of each player. Studies from the Université of Québec in Montréal have shown that using the Newron training system replicates the exact stride and motion as ice skating, therefore working the same muscles and providing an ideal off ice training system for those players looking to improve their skating. Players can now substitute the expensive ice time at a rink for free concrete or asphalt surfaces around the world, and workouts are not limited by time constraints but rather the endurance of each player. Furthermore, parents don’t even have to take the child to a rink to get those extra hours of ice. Designed for speed skating, this frame will provide you with a flowing freely skating motion and a better support on surfaces. Increases your speed and improves your performance in cornering. The double tandem wheels allow you to increase your speed due to the better support of the 4 wheels on the surface. Designed for roller hockey, this frame will give you a flowing freely skating motion similar to ice skating. Increases your speed and improves your stride. The Newron RFP chassis allows athletes to improve their performance. Adapted to receive wheels 90 mm (a frame that can receive wheels 100 mm and 110 mm is presently being designed). Our wheels come with 608zz bearings. 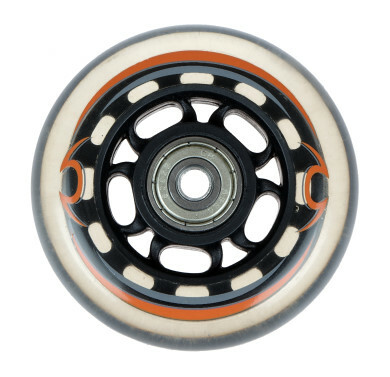 Higher precision bearings are designed to allow high precision roller skate to operate smoother and at higher speeds than a standard bearing would allow. We offer wheels in 72mm, 80mm and 90mm diameter.